Easilocks Human Hair Extensions are a Revolutionary Human Hair Enhancement System, that uses only the finest 100% Human Remy Hair which is ethically sourced globally guaranteeing the most natural results blending beautifully with every hair type. Easilocks Human Hair Extensions is a Revolutionary Human Hair Enhancement System that uses only the finest 100% Human Remy hair. This is ethically sourced globally guaranteeing the most natural results blending beautifully with every hair type. Making it the celebrity’s choice! Easilocks looks and feels just as natural as your own hair and just as comfortable to wear! 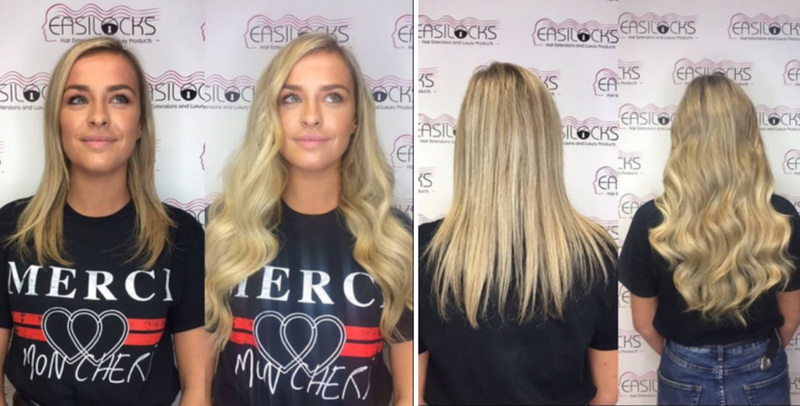 The Easilock method is the only hair extension system available today that has been carefully designed to preserve the integrity of your natural hair whilst adding volume and length without having to worry about the long term effects. The human hair is attached with Microscopic copper locks which are kind to both hair and scalp. Easilocks blends incredibly well with the natural hair virtually undetectable to the eye, available in a wide variety of 42 colours and lengths from 14 to 22 inches. Easilocks can be worn for 3 months (8 to 10 weeks for fine hair) without any servicing and the hair is reusable again and again – Making this system affordable for every budget. This stunning full head of Easilock I-Tip Extensions was created with 120 Strands for length and thickness.